Don’t get me wrong, the game plays very well once you get past the initial clunky combat system. Eerily, it reminded me of MediEvil 2, a classic with a smart camera that always seemed to look where you want. Meanwhile, FFXV might do combat in an eerily similar fashion, but the camera very often gets occluded by shrubberies and close ups of Ignis’ crotch. Let’s talk about our heroic team. It consists of Noctis, Ignis, Prompto and Gladiolus. The moment you get control, you have access to all four heroes. Sure, in the earliest Final Fantasy titles this was common, but I always am reminded of what I deem the great five: Final Fantasy VI through to X. These games introduce characters in a very intelligent fashion, not through “one of our squad is prince”. You know, I might be too harsh on the crew. They’re all so very likeable in their own unique ways. Ignis loves to blast through walls just to tell us of his new recipe that he came up with by picking up an onion for the first time. Prompto loves to snap pictures of the world and his friends, sometimes to stunning effect. Gladiolus likes to… get items. Noctis loves fishing! They’re a little random, but it brings a touch of character out of them. They certainly fit the characters: Quiet Noct and his solitary fishing, creative Ignis, snap-happy Prompto and survivalist Gladiolus. 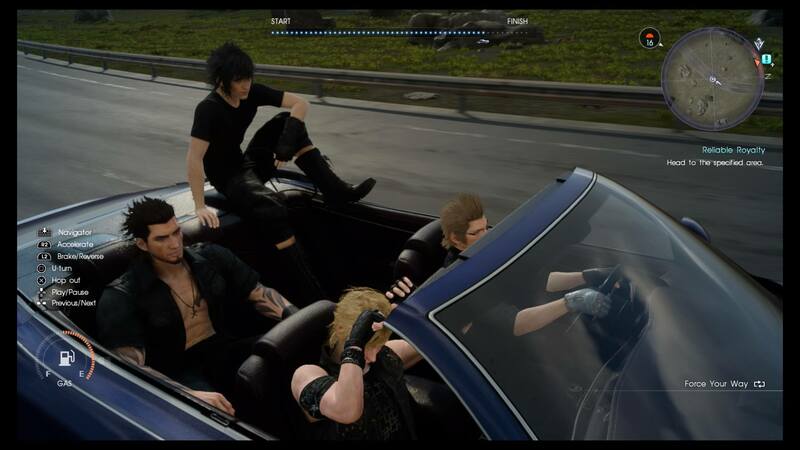 Unfortunately, early game, with the exception of Gladiolus giving Noct a verbal beating, you don’t see much story between the boys. Even their road trips look devoid of love and friendship, but effectively a group born out of necessity alone. 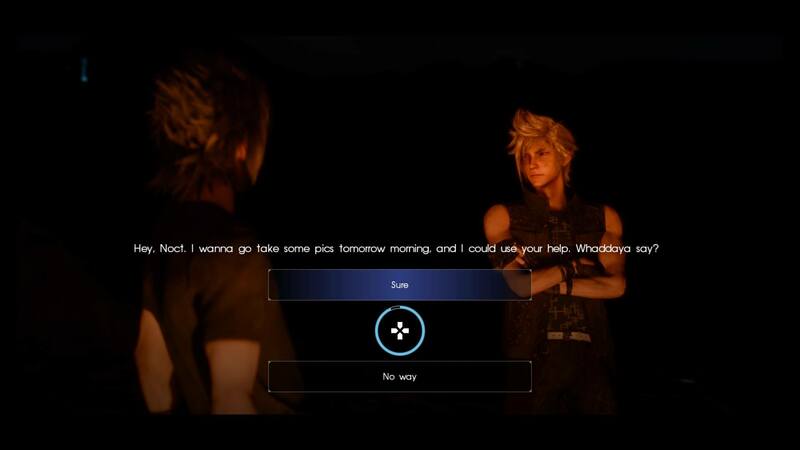 The story does get tough on old Noct, but even the camp and cheerful Prompto doesn’t really add much, bar from “Who should I take more pictures of today?” Really: He does ask you that! I haven’t even touched on many of the elements in this game that feel broken. Be it the Imperial soldiers jumping down to attack you whilst you are TRYING to get a gem for a sidequest, or the fact that people have literally found unfinished maps in the game. Perhaps they were under time pressure to release the game, which has seriously deviated from their typical quality. Don’t even start on “But you can run away from the Imperials”, the fact that has to be mentioned proves what’s wrong with it! 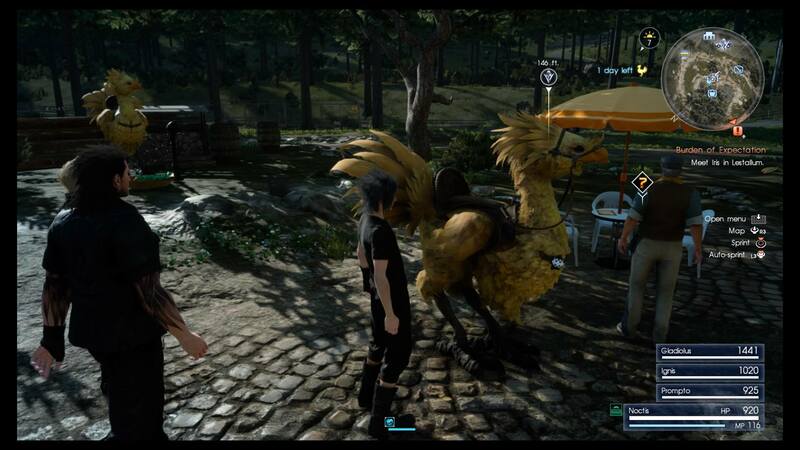 One major saving grace for FFXV is the amazing Chocobo system. This is well executed and is all together great fun. Rent your Chocobo for 50gil a day, ride them to level them up and gain benefits for doing so. From them having more stamina, to lending a helping hand in combat, Chocobos are smart and a great way to travel through the frankly lush world. I have yet to get into the meat of the game, but this is not a Final Fantasy like any other. This isn’t necessarily a BAD thing though. The intriguing nature of the admittedly slow paced story is a great way to do a slowly burning story, of which the climax might be worth the wait. Pardon me to those who got some rather vivid imagery just now. … but the tagline “A Final Fantasy for old fans and new fans” feels like a lie. But is it a good game? Well I certainly haven’t given up on it… but it frustrates me enough to stop me completing it quickly. Let us know what you think: Am I so wrong I deserve to be written off the Internet, or am I hitting a few of the points on the head? As always, leave your comments below or over on Facebook, Twitter or Reddit. This entry was posted on January 13, 2017 by Timlah. It was filed under Gaming posts, Video Games and was tagged with Final Fantasy, Final Fantasy 15, Final Fantasy XV, Gladiolus, Ignis, New Recipe Gif, Noctis, Prompto, video game, What's Bad About FFXV, What's Good About FFXV.